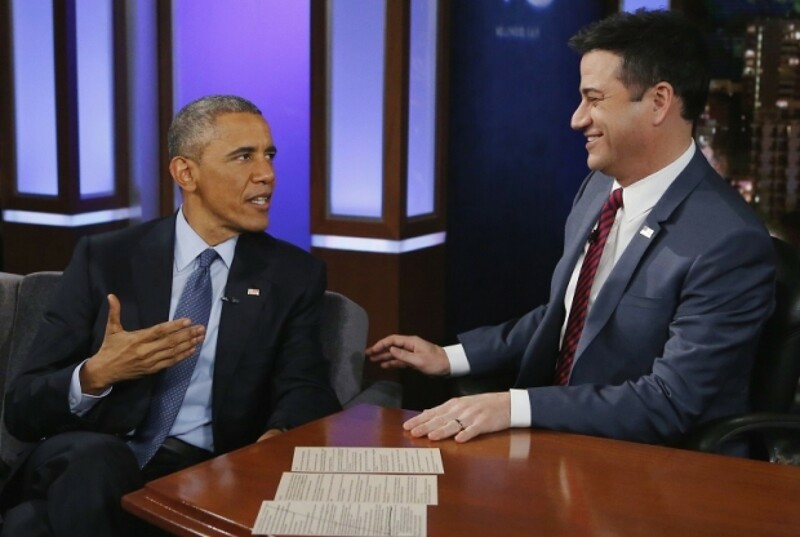 Late last week, President Barack Obama went on Jimmy Kimmel to read some classic “mean tweets” and such (see below for some comic relief). ICYMI: the interview touched on many aspects of pop culture, sports, pseudo-politics, and other talk show fare. Kimmel even offered to clear up the rumors about home phone calls with Kanye “Mr. Kardashian” West. Kanye is a firm devotee of the Kardashian PR plan: don’t say or do ANYTHING unless you’re within earshot of a paparazzi or a TV crew. How sweet of him. You get that, as Captain Swellhead was strolling through LAX on his way back from Paris Fashion Week? There’s your classic, always-successful “blame the media” approach: one man contradicted what the other said, and the TV camera just happened to be the delivery mechanism. Let the public decide! And we wonder why young people don’t think they should have to pay for this stuff.